By Alaba Ajibade – The Independent National Electoral Commission (INEC) has barred the voters from taking phones and other electronic devices to the polling booths during elections. 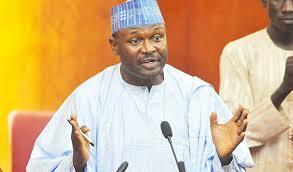 INEC Chairman, Mahmood Yakubu, made this disclosure Monday in Osogbo, the Osun State capital, at the stakeholders’ forum organized ahead of the State’s Saturday Governorship election. Prof. Yakubu said the measure was taken in order to check vote-buying and vote-selling syndrome, a practice he described as a new strategy adopted by politicians to rig elections. “The menace of vote buying is now a new concept in our electoral system, and I can assure you that the commission will rise to these challenges,” he said. However, INEC boss clarified that voters would not be barred from using their devices at the polling units, still, they would not be allowed to hold items such as: cameras and telephones from the moment they are issued with ballot papers until they cast their marked ballots inside the ballot boxes. “I want to make clarification on the use of mobile phones, we are restricting its usage from the time a voter gets ballot paper and cast his vote, in which the device will be returned thereafter,” he said. “Our ultimate objective is to ensure that the choice of who governs the people of Osun in the next four years is in the hands of the electorate,” said Mr Yakubu. The electoral body has fixed this Saturday, September 22, 2018 for the Osun State Governorship election. The frontline contenders are: Mr. Gboyega Oyetola, a former Chief Staff to Governor Rauf Aregbesola and candidate of the ruling All Progressives Congress (APC); a former State’s SSG and candidate of ADC, Mr. Moshood Adeoti, and Senator Demola Adeleke, contesting on the platform of the opposition People’s Democratic Party.